On the afternoon of Sunday, May 22, 2011, everything changed for the people of Joplin, Missouri. That’s when a massive EF5 tornado, nearly a mile wide at its peak, struck the city. Killing 161, injuring more than 1,100, and causing $2.8 billion in damages – making it the costliest tornado in U.S. history. Nearly 20% of the city was destroyed. 7,000 homes lost, more than 9,000 residents displaced, and 40% of the city receiving some kind of damage (including the local hospital, St. John’s Regional Medical Center, which was damaged beyond repair). There is much involved in a community recovering from such a devastating blow. Restoring homes, infrastructure, and basic services are tasks that continue to this day. But the question of healing is a deeper issue. To help the residents of Joplin heal, connect, and process their stories of trauma, the city turned to a different resource: art. During the recovery process, the Joplin community realized the need to help community members process their experiences. “Someone may be too traumatized to talk about an event, but are able to express their story through art,” said Patrick Tuttle, Director of the Joplin Convention & Visitors Bureau. With the involvement of the community, many public art projects were created to help Joplin tell its story. Painted murals downtown depict images of Joplin faces and history. A series of sculptures throughout the city were sold to help provide funding for a disaster recovery summit. 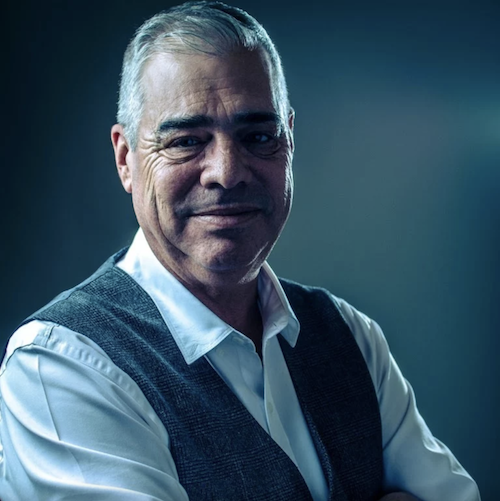 A Joplin-born composer created and performed a piece of music about the tragedy. A local nonprofit, Art Feeds Joplin, provided art therapy programs for many Joplin children traumatized by the tornado. Joplin Proud, a group of volunteers working together to commemorate the tornado, coordinated shared creative activities for residents, including children’s art projects and a community-wide journaling experience. The culmination of this series of projects was a plan by Joplin Proud to construct a free-standing mural in Mercy Park, a new park located on the former site of St. John’s Regional Medical Center. This mural would serve as a lasting tribute to the spirit of survival and recovery established in Joplin, and an interactive piece of art that could be enjoyed by residents and visitors alike for decades to come. 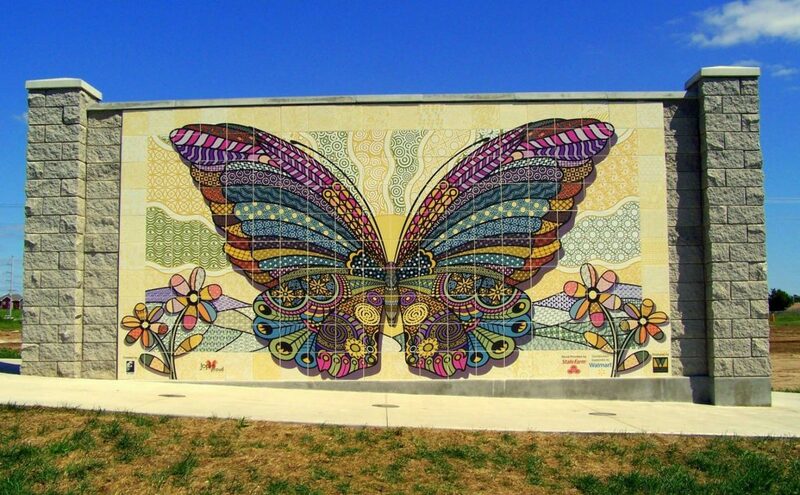 The art throughout Joplin took on many forms, but the main theme running through all of it was butterflies. The image of a butterfly has meaning in terms of recovery – “The metamorphic growth of a butterfly is symbolic of our recovery as a community and regional hub,” said Tuttle – but the primary motivation for using butterfly imagery came from a phenomenon reported throughout Joplin in the wake of the tornado. After the tornado, many local children reported seeing and being protected by butterflies or “butterfly people” when the tornado hit. Some believed they were angels; others felt them to be a more indescribable presence. But the butterfly stories spread quickly and became a powerful image for the community as they came together to recover from the storm. From painted murals to public sculptures to community children’s art projects, the butterfly theme was present everywhere. 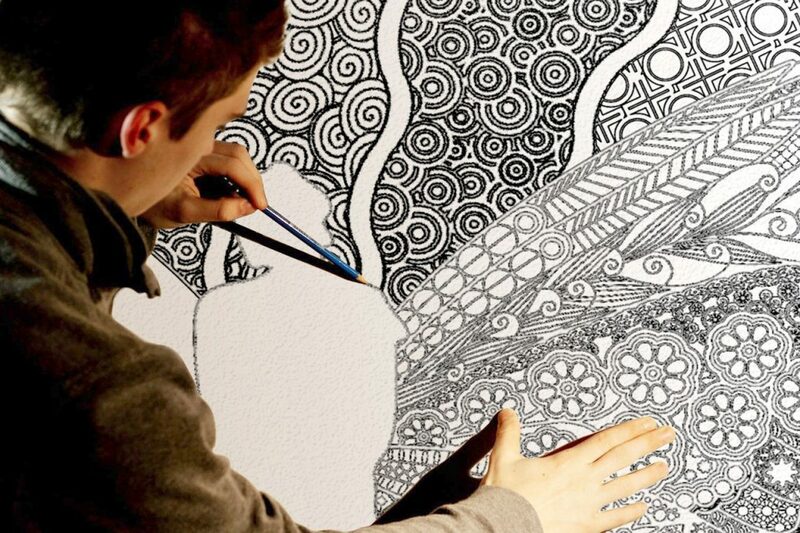 Tuttle, inspired by murals he had seen in New York City that allowed visitors to stand between large sets of wings to have their photos taken, proposed a similar idea for the mural in Mercy Park, using the image of butterfly wings. With funding support from a State Farm grant, Joplin Proud was now ready to make the vision a reality. To design and build the mural, Joplin turned to local artists with long-standing connections to the city. A.J. 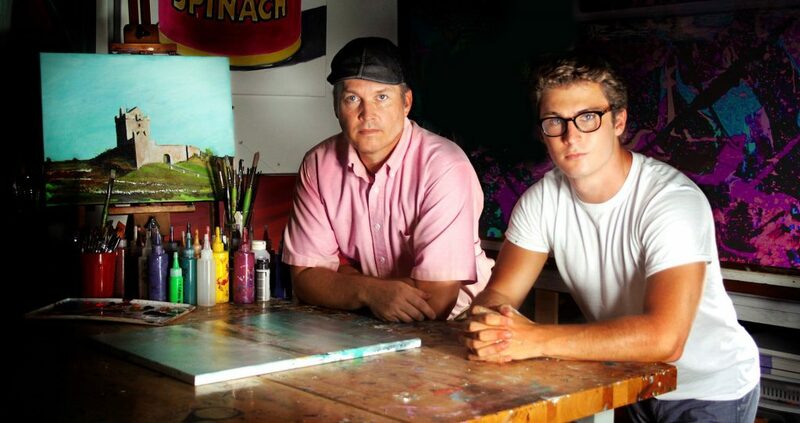 and Jordan Wood, a father-and-son team of artists who work under the name Mythiq Art & Mural, were chosen to create the imagery for the mural. A.J., who grew up nearby in southeast Kansas, spent time in Joplin as a child and moved his family there in 2002. 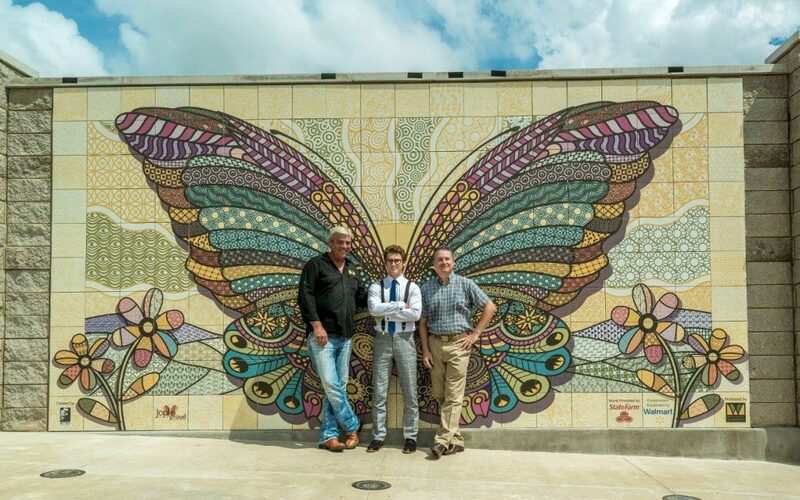 To make this mural a durable and lasting effort, the community turned to Paul Whitehill of Whitehill Enterprises, an experienced, professional mural artist specializing in tile murals. Shortly after the tornado, A.J. wrote a butterfly-themed poem about the experience, and had been photographing butterflies with a powerful zoom lens to examine the fine details of their wings. Now six years removed from the tornado, Joplin’s recovery work continues, but the city has made incredible progress. Nearly 2,000 homes have been built and 300 new businesses established, numerous road improvement, trail, and park projects are underway, and the hospital – now called Mercy Hospital Joplin – has been rebuilt. The city’s population is at its highest point ever, having grown in the years since the tornado struck. Butterfly, spread your wings and fly. and dry yourself in sunshine anew. You show your true colors with pride. a wonder now world beholds. on the winds of tomorrow’s promise.